YouTube influence in UK politics is growing and UK politicians are having to quickly adapt to a new way of communicating with voters. Much as politicians had to learn new techniques as TV became a mass medium, so politicians are having to adjust to be able to successfully communicate using new web channels like YouTube. 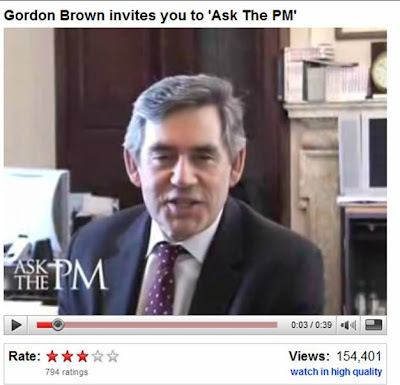 Run through the Downing Street channel, the 'Ask The PM' initiative is allowing YouTube users to upload video questions for Gordon Brown. The YouTube community then vote to establish the most popular questions and Gordon Brown has pledged to answer them on 23rd June. In an effort to engage younger generations the House Of Lords is uploading explanatory videos to the Parliament channel on YouTube. We have already seen the launch of 'Lords Of The Blog' an 'experimental blogging project to encourage direct dialogue between web users across the world and Members of the House of Lords' and a YouTube presence is the obvious next step. Five videos have been uploaded to start things off (including 'House of Lords- what's it all about') with the promise of more to come. According to Lord Speaker Baroness Hayman, the House Of Lords hopes that the YouTube channel "will help to combat some of the outdated stereotypes of members of the upper house." YouTube as a campaigning tool will grow and by the time the next UK general election comes around (2009?) it will have a significant role to play. The Downing Street channel on YouTube started out as hub for historic Prime Minister / government speeches and video from the Downing Street archives (eg Lloyd Georges first visit to Chequers or 'Bonar Law forms a new government.') In recent times though it has tended to aggregate the activity of Tony Blair / Gordon Brown with speeches and policy announcements making up the bulk of the DowningSt channel videos. 'Tony Blair félicite Nicolas Sarkozy (en français)' is by far the most viewed clip on the Downing Street channel with 485,809 views. After Sarkozy won the French election Tony Blair recorded a congratulatory message in French and presented it through YouTube. This has a very high view count and shows an implicit understanding of how to use YouTube effectively. No-one has yet defined what the official Downing Street YouTube channel should be for, but the views received for Tony Blair's message to Sarkozy show how effective it an be if used properly. All of the above point to the growing influence of YouTube in UK politics. YouTube will engage younger generations far more effectively than an MPs constituency surgery or door box generic printed material. YouTube allows a two way dialogue with youth on their terms (they can choose whether to engage and choose the timing and terms on which they do so) and against the backdrop of the US primary campaigns, the UK political establishment is starting to realise how important YouTube is becoming. About time politicians noticed how important YouTube and its ilk are. Some of us have been telling them for some time, including jihadists. Interesting that Blair's French video is so highly watched. Perhaps by the French? So maybe he isn't quite finished with his EU presidency ambitions. Bonne chance à l'homme, je dis. I have put together a little video on Brown's predicament and posted it on YouTube, if anyone wants to have a look. There are 2 versions of the Tony Blair Sarkozy video - one in English, one in French and the French video has a much higher view count. I think this was a clever use of YouTube - though I hadn't considered it might have an underlying future political significance!